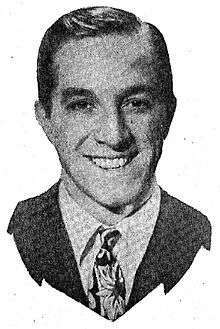 Buddy Lester (January 16, 1917 – October 4, 2002) was an American comedian and actor who played dozens of character roles in films and television. Though probably best known for his appearances in Jerry Lewis's comedy films, he was also regularly seen on popular television shows (such as The New Phil Silvers Show and Barney Miller) in the 1960s and 1970s. As a comedian, he was a fixture on the international nightclub circuit for several decades and was the brother of comedian Jerry Lester. William "Buddy" Lester was born Jan. 16, 1917 (some sources state 1916), in Chicago, Illinois. He began performing in variety shows in Chicago theaters at the age of seven, with his older brother Jerry, who later became host of Broadway Open House, the television forerunner of The Tonight Show. He claimed in interviews that an early booster was the notorious mobster Al Capone, who helped the underage entertainers get jobs in nightclubs. After serving in the Navy during World War II, Lester, already an established stand-up comedian, stage actor, and radio host, eventually began appearing in films and on TV, becoming a popular character actor. His first film role was playing himself, as a nightclub entertainer, in the 1959 movie The Gene Krupa Story, which starred Sal Mineo. He regularly appeared in Jerry Lewis features, including The Patsy, The Ladies Man, The Nutty Professor, Three on a Couch, Cracking Up, Hardly Working and The Big Mouth. Although known mainly as a comic actor, he was also effective portraying tough underworld characters, in part because of his tall stature and a distinctive scar down his right cheek. He enjoyed concocting stories about the origin of the scar - claiming at one point to have received it in a sword duel while a student in Heidelberg, Germany - but admitted that it was actually the result of falling onto a broken drinking glass when he was three years old. Lester portrayed Vince Massler, one of the gang members in the 1960 film Ocean's 11 with Frank Sinatra, for whom he performed as opening act many times. Another standout role was as Davey Kane in the classic Peter Sellers comedy The Party. Actor Buddy Lester in a 1970 episode of the TV show Dragnet. In the 1963–1964 television season, he played the role of Nick in Phil Silvers's The New Phil Silvers Show, a sitcom set in a factory of a large corporation, with co-stars Stafford Repp, Herbie Faye, Elena Verdugo, Ronnie Dapo and Sandy Descher. He also played Peter Evans, a crooked gambler, in the third season of the show Gomer Pyle, USMC. He was also a guest star on Make Room for Daddy, where he played the part of a competitive comedian who stole some of Danny Thomas's comedy material. In the late 1960s and early 1970s Lester appeared in episodes of the show Dragnet, and later in the 1970s as 'Sidney' the bookie on the hit series Barney Miller. He appeared in many other TV shows and movies from the 1960s through the mid 1980s, while regularly performing as a stand-up comedian. Buddy Lester died in a Van Nuys, California nursing home on Oct. 4, 2002. He had a son and a daughter, and several grand- and great-grandchildren. His older brother Jerry Lester died seven years before him, at the age of eighty-five, in Miami, Florida.